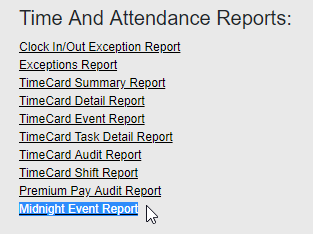 We have recently added a new report which we are sure you will find very useful: the Midnight Event Report. The idea behind it is that it will show you all of the punches for a specific time period that cross midnight in the local time zone of the field worker in question. As with most of the reports, this one can be filtered by team, user and start and end dates, as well. Keep in mind that it will show you the start and end times of exactly the task the employee was in while crossing midnight, not the entire shift. Let us know if you have any comments or questions, look forward for more updates to come!